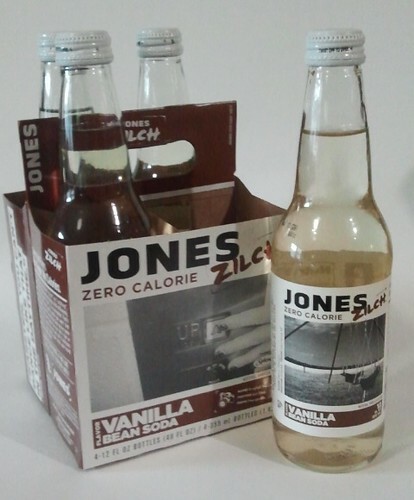 Jones Zero Calorie Zilch sodas just started turning up in the stores around here. They've been available for a couple of years now, but not many of my regular stores carry Jones to begin with, and the ones that do rarely have more than a couple of regular flavors, let alone Zilches. Lynnafred really liked it. She said that the flavor was "subtle" and that there was minimal aftertaste from the Splenda. I enjoyed it - I like vanilla, and there are few true vanilla sodas on the market - but not quite as much as she did. For me, the subtlety of the flavor bordered on bland and the artificial sweetener used (sucralose, also sold under the brand name Splenda) left a bit of a chemical aftertaste. Would I buy it again? Probably. i'm going to be keeping an eye on the market for the other Jones Zilch varieties such as Pomegranate or Black Cherry. Have you tried the Zevia sodas yet? They're sweetened with Stevia and the ones I've had were pretty decent. I wouldn't pay full price for it (I never pay full price for anything if I can help it!) but if you hit a BOGO sale it's worth a shot.